Over the past three decades, A.B. Richards has been serving the great historical state of Connecticut with all their storage container needs. A.B. Richards has been aiding small business owners, homeowners, retailers, manufacturers, wholesalers, restaurants, and the industrial and commercial industry with a variety of on-site storage container rental solutions at affordable prices to the people of Connecticut. Fill out the form or call (800) 597-5971 now to get a free quote about storage containers in CT! With three different storage container products a dedicated and trained staff member will help you determine which model is the correct choice for your storage needs. 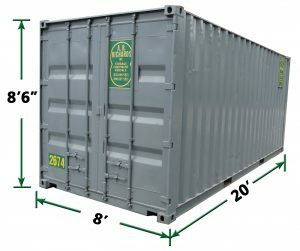 We offer a 20ft storage container, which is a great option for small storage such as record keeping and spring-cleaning. 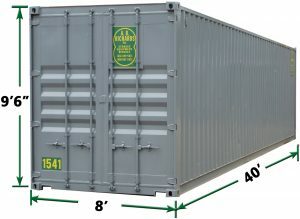 We offer a 40ft storage container, a great candidate for larger storage such as excess inventory. 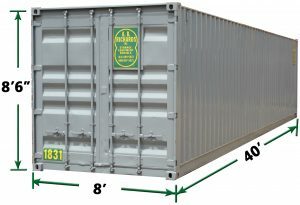 And we even offer a 40ft jumbo container, which is used primarily for contractors who are looking to keep their equipment on-site. Our storage containers are delivered right to your business or home address so it’s quick and convenient! I rented a container from AB Richards for 6 Months, everything was as promised. There were no hidden fees when it came time to have the container picked up. Will rent from them again. – Chris Bridgeport, CT.